So what is it that defines option spread trading? It is simply about taking opposite positions in terms of buying to open and selling to open (ie. writing) a number of option contracts for the same underlying financial instrument, but using different strike prices or expiration dates, thus creating a spread of positions as part of a single strategy. Creating an options spread trade can give a number of advantages. Firstly, although it will cost you more in brokerage, the overall position in terms or risk vs reward will ususally be cheaper than just straight out buying. This can make all the difference if your trading capital is not very much. Your trades will cost less, so you have more control over money management. Thirdly, options spread trading will allow more flexibility when choosing the expiry date. Because you are selling to open as well as buying, you can often stretch out the expiration date of both positions without affecting your overall cost for the trade. This will allow you more time to be right and make a profit. You could even now 'average down' by taking out another call debit spread at lower strike prices. The combination of this new spread, plus the long call still held from the old position, could make you well over 100 percent profit on your investment, even if the stock only returns to it's original level at the time of your original trade. The above scenario assumes the underlying is not now taking a long term nose dive due to some financial crisis or extremely bad news. If this happens, you would start concentrating on bear put spreads. The profit on the put spread would offset the loss on the call spread. With option spread trading, you can sometimes take advantage of the situation even when the price goes against you. Let's say you have taken a call debit spread, seeing that the price of the underlying has fallen recently and believing it is due for a rise. But to your disappointment, it continues to fall. This now means that your 'sold' position, being further 'out of the money' than your bought positions, will be very cheap. So you can now buy it back for a fraction of what you received for it. If you've allowed yourself plenty of time, you now hold only your bought position and simply wait for the underlying price to rise again. Debit Spreads - are when you simultaneously buy a position with a strike price close to the present market price of the underlying stock or whatever - and sell to open for the same expiry date but further away from the current market price. This will take funds from your account and is therefore called a debit spread. Credit Spreads - these occur when you do the opposite to the above. You sell closer to the current market price of the underlying and buy further 'out of the money'. Since the option prices closer to the money will be more valuable than those further away, you will receive a credit to your account. Other Spreads - There are more advanced strategies, such as ratio backspreads, range trading spreads like calendar spreads, butterflies and condors - and delta neutral spreads such as straddles and strangles. They are more difficult to explain and each one of them could be the basis for an article in itself. Option spread trading provides the trader with some powerful advantages over simply 'going long' on an option contract. These advantages give greater flexibility when things go wrong, decrease your cost per trade and allow you to extend the expiration date of your positions (assuming there is sufficient open interest) at little or no greater expense. There are some other things you need to pay attention to, but if understand what you're doing, there is a tremendous amount of money that can be made. So come with me and let's explore this subject futher . . . . So what is the advantage credit spreads give us? 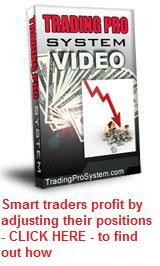 This example will demonstrate how we can turn a losing trade into a profitable one. When rolling credit spreads there is one simple rule which you need to know to ensure you keep your profits. Monitor the net value of your original position and don't leave it until it's too late! Have you considered the advantages of trading credit spreads with the short position in-the-money and the long (bought) leg of the spread at-the-money? The Bull Put Credit Spread is a low risk, flexible option trading strategy that is normally employed when you are bullish about an underlying security. The Broken Wing Butterfly is a variation of the traditional option butterfly spread. The main difference is the choice of strike prices. The Iron Condor Spread is really just two credit spreads combined, but facing opposite directions separated by a range in between. But it this gives it distinct advantages over credit spreads alone. One trap that iron condor traders fall into, is that they wait until it's too close to expiration date before exiting the position. By this time, your ability to adjust the trade has been compromised. An effective Iron Condor setup involves getting a few critical things right and matching them with your preferred trading style. Get this right and you can't go wrong. In this iron condor option strategy we show you the best way to leg into positions safely as well as how to adjust your positions when they are threatened. The bear call calendar spread is a combination of the option credit spread and calendar spread strategies. It is simply a credit spread but with an expiration date variation. Box spreads are an option trading strategy that involves purchasing a bull-call spread with a corresponding bear-put spread. The two vertical spreads have the same expiration dates and strike prices. The put ratio backspread is an option setup that profits from anticipated price drops in the underlying while still realizing some profit if you got it wrong. The call ratio backspread is a bullish options strategy. The appealing thing about this strategy, is that it involves limited downside risk when compared to just buying calls. Front spread options are created when you design a ratio spread where you sell more contracts than you buy. It is the antithesis to the Backspread. The ratio call spread is used when the trader believes that the price action in the underlying market will remain within a range that is at or above it's current position, but will not go too far north before expiration date. The following debit spread example shows how that, even when the price of the underlying financial instrument goes against you, you can still make a nice profit on your investment. Calendar Spreads are a popular low risk, high profit potential, options strategy for traders who believe that an underlying security, is going to be trading within a range in the near term. The call calendar spread, sometimes called the bull calendar spread, is an options spread strategy that is most suited to market conditions where you believe the underlying financial instrument is due to rise within the short term, but not by too much. Ratio backspreads are considered to be one of the safest longer term option trading strategies available today - so much so, that they have sometimes been called "vacation spreads". Bear put spreads are created by buying put options with a strike price close to the current security price and selling the same number of put options at a strike price lower than the bought options. The diagonal spread is one variation of option spread trading that has been used most effectively to adjust existing spread positions.